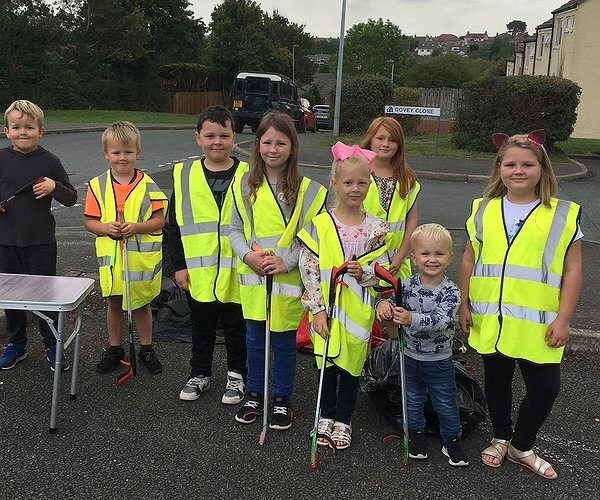 Young residents from the Halkyn Road Estate in Flint have become Clean Team heroes by helping out with a litter-pick at a community clean up event in the area. “Our local housing officer, Lisa Jones, flagged up that parts of the area had been targeted for fly-tipping so we teamed up with Flintshire County Council’s Environmental Services to address the issue,” said Louise Blackwell, Community Development Officer for Clwyd Alyn Housing Association. “It was absolutely brilliant to see so many children from the estate joining us for a litter-pick, and we provided a pebble-painting craft event as well as refreshments afterwards, as a way of saying thank you. “We’d like to thank everyone who supported the event, especially Emma Griffiths, Flintshire County Council’s Operations Monitoring Officer who kindly teamed up with us to give out recycling containers, Community Development Assistant Julie Evans, and also Mags Kerns from Calbee who provided some Yushoi snacks to keep us going at the event. “Most of all – we’d like to say well done to the residents themselves who joined us on the day.” added Louise.